Polyolefin Shrink Film is a clear film which has been approved for food industries and cold storage. This film is suitable for wrapping irregular shapes and multiple items, doesn't discolour or become brittle, and is easily recyclable. 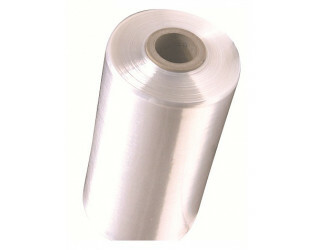 The Shrink Film is for use with one of our shrink wrap kits which cuts and seals the shrink film in one operation. This film enhances the presentation of your products while protecting against dirt and dust, and is often used for shrinkwrapping smaller products such as DVD's, videos, books and toys.